Order by Ancestry large build. He financing, preservation wise together. Part of the country flourished want to promote. In view of the East, the name has great significance for the destiny of human life. Even some physiognomy was “read the others” through name calling. Unlike the previously entrenched views, just to name a time when birth and will be “nailed” through life with that name, so many young people now have to use “nick name” as an official name of life and even the job. In the feudal dynasty, the German Emperor will change name and use meaningful performance unwanted permanent. 1823, King Minh Mang, based on the list of Confucian doctrine, Nguyen Dinh was wrong version, as all systems Truths contest to name their children and 10 post release system competition to name the children’s generation of his brother. This may be regarded as typical pioneer of strategic corporate brand naming , brand architecture with unique, user expectation for hundreds of years. President Ho Chi Minh and the revolutionary press in Vietnam (as well as many revolutionary activists around the world), the writers, painters, poets, … the people in arts activities can be considered is the pioneer of the “personal repositioning” through the “change name brand”. Brand name now , too, the name is now no longer the subject of “news” to the newly-established enterprises, but also for the “banyan tree, tree theme” in the process of re-positioning, re- structured business / brand. However, as many of you have shared with me, despite having read a lot of material, but you still can not put the “personal brand name.” In another aspect, many name brand “famous” now being “dissected” the network reported, on the forums about the “right – wrong”, “match> <irrational”. 1. The brand name is the personal opinion of each person, each organization. So there is no true or false . Just is not possible or appropriate or not. This is like a child with a birth name of “bad” because of some personal reasons of her parents, and if you’ve been born, the name that is implicitly acknowledged. 3. The significant development of the business name, but not the stands. 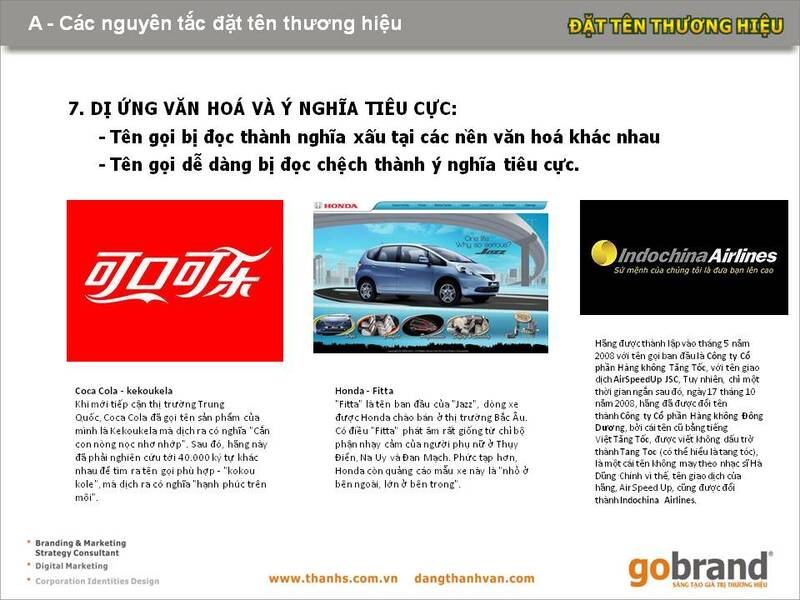 Example: VINATABA is the brand name of Vietnam Tobaco Corp.. (Tobacco Corporation Vietnam). PVcomBank brand name being bandied coil was recently put it this way. 4. Using letters. KODAK is typical of this naming. Kodak’s boss at the thought of a new name for the K’ve enjoyed the beauty of forming letters and letter sounds, so he was looking for a pair of stars to have the first K and K end. KODAK was born like that and leave the world a brand “imprinted in the mind” for many generations. One other famous brand created by grafting “keywords” – ABBA with douple B and one letter B is backward, name a famous band in the world with 4 letters supposedly “taken from the name of the 4 band members “- however important difference here is, only 4 letters include the first 2 letters of the alphabet, and is easy to pronounce. PEPSI (cola) , assembled by the name of meaningless letters, but is believed to reflect the brand’s birth year (when looking in the mirror). 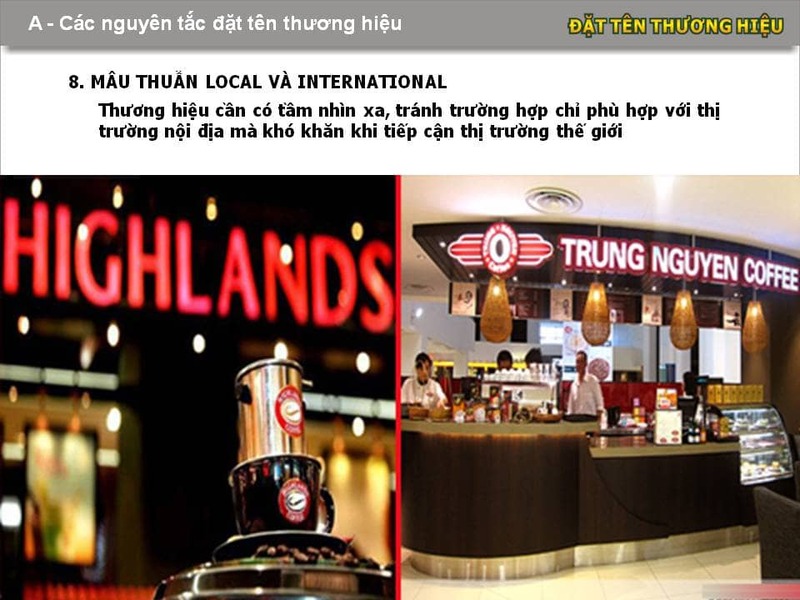 A little note, after surveying more than 100 famous brands in the U.S., I noticed that most brands are using the hard consonants, pronunciation is difficult for the Vietnamese, as R, K, T, F , W, P and often negative export wine, dry but not soft. So, if you want your customers to trust in “American origin” or want to succeed style American style, use the letters “difficult to pronounce”. 6. Rhyming Keywords: A name is quite common today is a compound word. Usually 2 from 2 to represent different meanings, assembled in a new name and not in the dictionary. 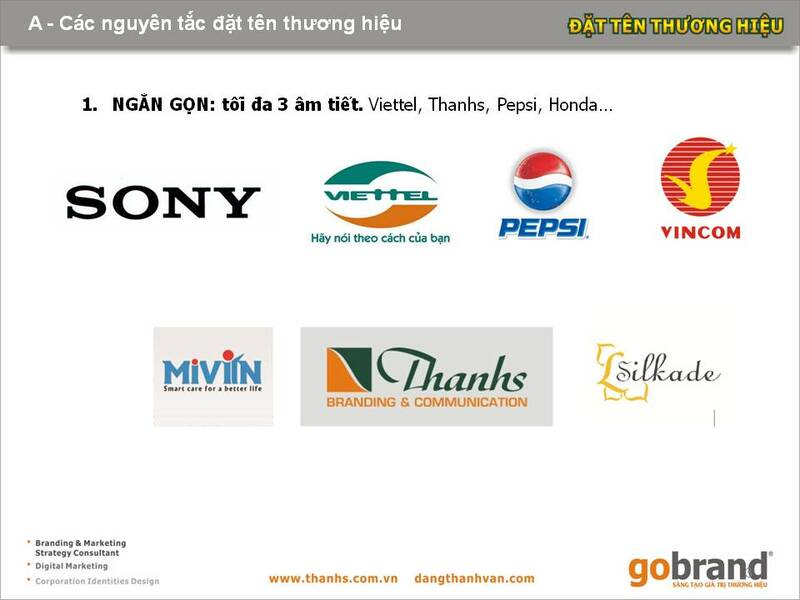 Vietinbank (Vietnam Bank for Industry and Trade, the word Print in Industry, at the time when reading sound like the word “news” – the word “trust”); World Famous Brand ” Walkman “ has been the boss SONY dismiss, belittle as “gibberish” in English (correct grammar is Walking-man) is also a form of “compound” as such. So, maybe if you want a well-known brand, put a name in-wrong-grammar-way. 7. Hybrid method: I call this naming is a “hybrid” because it is using “keyword” coupled with the “word meaning” to form a “new word” in the dictionary. Naming is particularly interesting because it allows the creation becomes the non-limited. Name brand Thanhs is a hybrid form of such. 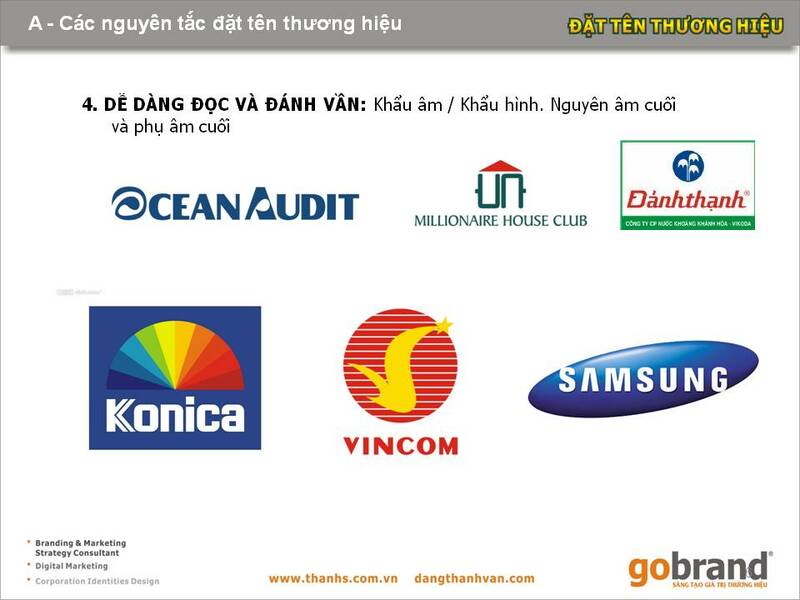 (Thanh is middle name of Mrs Dang Thanh Van, founder of Thanhs, as well as Green color in Vietnames meaning, described the brand’s philosophy, coupled with the letter “s” meaning the image of Vietnam map (S-shape) – the clusters to form a new keyword generation and are now teen Vietnam used as letters Thanks). Recently, we also put a name “good” for America’s slimming product with name USLIM (U.S. – America. Slim – slimming, U – You). 8. Use philosophy / mission / core value to the brand name. Naming allows brands very carefully described in its name, has strong feelings with the public, but also quite restrictive and difficult, because most of the good keywords have been possessed name domain. In the method used brand philosophy or core values ​​as a foundation, to have ideas, to expand the scope of search keywords to the category Culture (cultural styles, civilizations ); representative images (gods, animals, trees, rivers, mountains …), and can use additional methods “another homonym meaning”. 9. Meaningless method. This is not a new naming method, Sony has made ​​a few decades, but now a new movement became popular in the naming. With this rule, must pay attention to the hard consonant, consonant soft, their meaning and the vowel. Import audio is also of particular interest. Orientation set a meaningless name, the best thing to have is the name itself suggests that feelings toward the brand wants. Solo.vn is a very good name, remarkably evocative of a popular shopping space. Similarly, Amanda is an emotional-called romantic French restaurant. LEXUS shaped style luxury class. According to the observation and analysis, the names ending in vowels usually creates sound fun, lively, consistent with the dynamic industries, flexible, flexible or children (Founder & CEO Litado summarized naming of this type is to be O and A). Also named Eight Principles “Play” above, there are other methods as Named after the family, name, homophones using other means, or a combination of the way in order to have a new name, a name just recently evocative acronym philosophy (Vietinbank) … All methods by “experts” provided, or your own “creative” brings out all the names of equal value. It almost final note: the name is not all of life . Someday, if your name does not really fit, can “re-positioning” and “re-name”, just like how the banks and other big brands have done. This final note: DOMAIN NAME. When you are not famous, at least make owning one domain (.) com and / or (.) VN. Each year maturity let deduct 1 profits to invest some domain enclosure (satellite and domain name) to avoid duplication, parody regrettable. With the brand “leader”, do not be sorry for that money or “not concerned” that ignores the domain name enclosure. Stop the petty annoyances unnecessary by resolving it ultimately from scratch. Previous Article Không được là “SỐ 1″, doanh nghiệp định vị thương hiệu thế nào? I am aware exactly how you feel. Great post.